Do you notice drafts or cold rooms? API offers professional infrared inspections performed by a Certified Thermographer. With the aid of a thermal imaging camera the inspector will be able to identify areas of poor insulation and air leakage. Using the computer report with infrared images you can make the improvements, lowering your heat bill and make your home more comfortable. For best results, API primarily performs heat loss inspections during the winter months, as there must be a significant temperature differential between the inside and outside of your home. 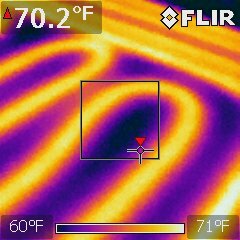 Call us today to learn more about our infrared inspections.